At Otto Suenson Wine we are great fans of Italian wines. 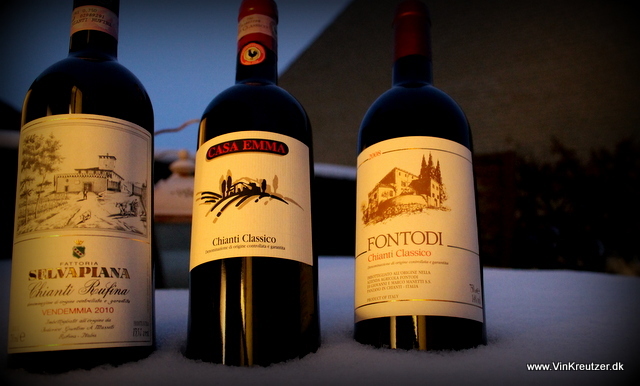 We import some of the very best from Italy, and from Chianti we have 3 very different producers. I have bought 1 bottle of each to sample this weekend, and I’m learning the difference by tasting the wines in random order, several times. The wines were tasted none blind, over 2 days. 2010 Selvapiana, Chianti Rufina – a classic Sangiovese, where the bitter cherry and cherrystone is very present. The nose develops from clear cherry fruit to more subtle aromas like sweet tobacco and milk chocolate. Th fruitacidity is medium + and the tannins very mellow. This wine is still very young, but the complexity is is good. After a few hours, the bouquet is fully developed and the wine is beautiful. 2010 Casa Emma, Chianti Classico – what a modern wine. Here is fat fruit that seems to come from long maceration, and maybe even a barrique? Strawberries and cranberry here with coffee and vanilla. The tannins seems sweet and mature on the palate with lingering notes ofmature red fruit. A very balanced wine, that needs a little classic Sangiovese bitterness. 2008 Fontodi, Chianti Classico – hello, this is a great wine. Fully developed aroma with notes of cinnamon and clean cut red fruit aromas. The sweet cherry mingles with spicy notes of cinnamon and cigar box. This is a wine where the secondary aromas have woken up and after the 2 youngsters you feel the age right away. Still plenty of fruitaciduty that keeps the wine fresh in nice balance with the tannin structure. What did I prefer? Good question, as always. I must say I like all 3, each for their own personality. As wine people, it’s important not to prefer one above the others, but try to explain the difference between all the wines. I will look forward to working with all these producers, and taste some of the better wines from these absolute top producers. Vigna dal Sorbo, Flaccianello, Bucerchiale, Soloio should all be names to dream about, if you’re a fan of Tuscan wines. Disclaimer: I work for the importer Otto Suenson Wine, but the wines have been purchased on my own budget. Selvapiana is a nice Chianti, that does almost always taste well, especially with a bit of age. I haven’t tried the two others.